Elsevier's relationship with altmetrics – measurements of online engagement – dates back to the beginning of this exciting field. In November 2011, Elsevier announced the winner of its Apps for Science Challenge, Euan Adie. His idea for measuring the attention that research articles receive via social media and online news sites won the Grand Prize of $15,000. The Altmetric.com score and donut visualization that Euan developed have been displayed in our abstract and citation database of peer-reviewed literature, Scopus, since 2012. They appear in the sidebar of document and abstract pages when data is available for the article being viewed. 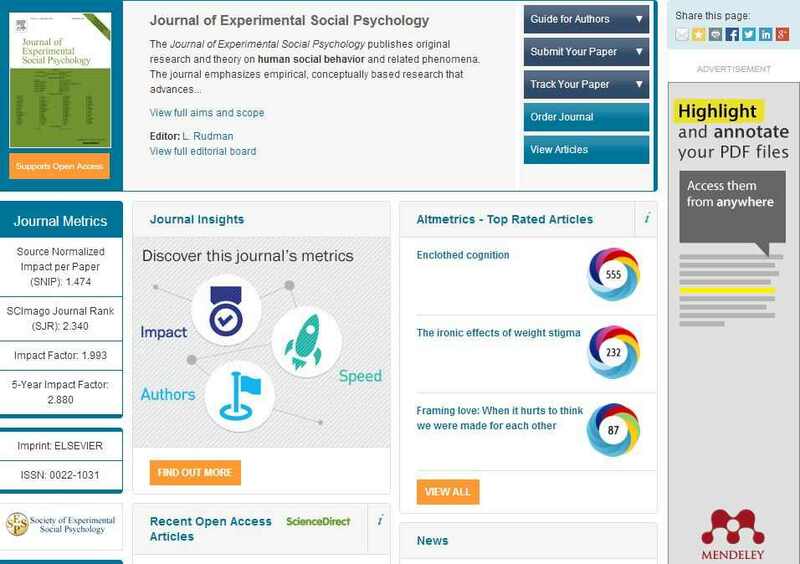 In November 2013, we launched pilots using similar visualizations on our research content platform ScienceDirect, and on Elsevier's journal homepages; you can read more about these in the Authors' Update article "Elsevier expands metrics perspectives with launch of new altmetrics pilots". Around this time, Cell and The Lancet also began to display a brick version of the same score on the online versions of their articles. These pilots are now ending and the results have been analyzed. Based on the results and your positive feedback, ScienceDirect and the journal homepages will roll out altmetrics data to a wider set of journals over the coming months. Elsevier's 2013 acquisition of Mendeley, the free reference manager and academic social network tool, also put Elsevier at the forefront of altmetrics data providers. We continue to make the Mendeley readership statistics freely available for use in applications and on websites. You can visit http://dev.mendeley.com/ and become a member of the community. Mendeley also hosts regular developer meetings at its offices, where you can learn more about the API that allows you to develop very complex applications using the Mendeley infrastructure. In its pilot for 27 large journals, ScienceDirect tested alternating altmetrics images on an article level. Visitors landing on the relevant pages had a 50 percent chance of seeing either information presented in The Lancet / Cell brick format, or the donut. User interaction with the visualizations was similar which indicated that the information was interesting, regardless of the manner in which it was presented. The journal homepages pilot involved 30 journals – both large and small – from various fields. The donut and article title for each journal's top three rated articles appeared in an 'altmetrics pod' on the homepage (Figure 1). 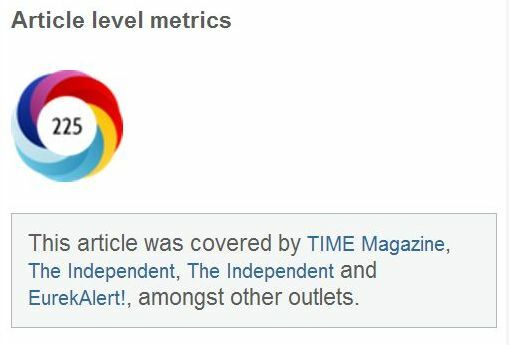 By clicking on the 'view all' option beneath the top three list, visitors could review the altmetrics score for the top 10 articles. Interestingly, 86 percent of visitors chose to find out more information by clicking on the article title – which took them to ScienceDirect – rather than the donut link to the Altmetric.com detail page. Elsevier is certainly playing its part in the wider community. Dr. Lisa Colledge, Director of Research Metrics, has been working with university research offices to agree a set of standard metrics they would like to use to give input into their university strategies. The Snowball Metrics group has endorsed altmetrics that are now included in their open and community-led institutional metrics program. The four Snowball altmetrics 'buckets' cluster together data types that result from similar activity; Scholarly Activity for example, is the number of times publications have been posted in online tools that are typically used by academic scholars, like Mendeley and CiteULike, and Social Activity counts the number of social media posts that have been stimulated by publications, such as those on Facebook, Twitter and Pinterest. William Gunn of Mendeley and Michael Habib, Elsevier's Senior Product Manager for Scopus, are at the forefront of the NISO (National Information Standards Organization) Alternative Metrics program which aims to advance standards and / or best practices in this area. Michael Taylor of Elsevier Labs plays an active part in the community, working with external groups on metrics formulations; attending and organizing conferences, funding postdoctoral research; and publishing various articles. Mike recently guest edited a special altmetrics edition of Research Trends, our free online magazine for insights into scientific trends, which contains a great deal of valuable contextual material, research summaries and thoughts on the future from key players in the field. Elsevier has also recently launched its Metrics Development Program to provide data and financial sponsorship to individuals and research groups working on research metrics. In the year ahead, we will start experimenting with displays of the 'buckets' of altmetrics data. Inevitably, as more research is undertaken, and more people become aware of the potential for exploring and sharing content offered by public and scholarly engagement indicators, this field will move on. There is already discussion on the future of the "alt" (for 'alternative') in altmetrics, indicating that they are increasingly perceived as mainstream. What are the practical applications for editors and authors? Researchers can already monitor the impact of their own papers published in Elsevier journals, and get more specific insights, via free tools such as ScienceDirect Usage Alerts and the weekly CiteAlert service. They can also, of course, discover who is talking about their articles by following the links from the altmetrics information on Scopus. But above all, researchers can get involved by starting to share their research via the social media channels that best serve their network, and by starting to include altmetrics information on CVs. Based in Oxford, Mike Taylor has worked at Elsevier for 19 years, the pastfour as a technology research specialist for the Elsevier Labs group. In that role, he has been involvedwith the ORCID Registry.His other research interests include altmetrics, contributorship and authornetworks. Details of his research work can be found on the Elsevier Labs website. He is currently producing a series of threeplays about scientists for Oxford-based theater company www.111theatre.co.uk. Marketing Project Manager, Hans Zijlstra is responsible for projectsfocusing on journal and article metrics with the aim of improving our serviceto authors. He joined Elsevier in 1996 after working as an expert in databasemarketing for a German mail order company and Visa. He held various seniormarketing positions before leaving to take on management roles in medicalcommunications, telecom, finance and sailing. He also set up his ownconsultancy, Zijlvaart Advies & Actie, specializing in cultural heritageand museum marketing. He returned to Elsevier in 2008, initially doingmarketing for magazines and webinars in horticulture and infosecurity. Viaportfolios in Computer Science and Biochemistry he landed in his current role.In his spare time he researches and writes about maritime history, genealogyand 17th century paintings, next to sailing the Dutch Wadden sea. Dr. Lisa Colledge is an expert in the use of researchmetrics that provide insights into research performance of universities,researchers, journals, and so on. She developed this knowledge "on the job" byworking with editors and learned societies to build understanding of journalImpact Factors relative to their competitors, and to develop strategies toimprove journals' standings. She then joined the Elsevier Research Intelligenceproduct group, which develops tools to support performance measurement, andmost recently launched SciVal. Lisa currently applies her expertise to SnowballMetrics, for which she is Program Director; in this initiative, a group ofuniversities agrees a single robust method to generate metrics that arecommonly understood, draw on a combination of all data sources available to theuniversities generating them, and which thus support internationalbenchmarking. Prior to joining Elsevier, Lisa conducted postdoctoral researchat the University of Edinburgh. She holds both a DPhil and an MA from theUniversity of Oxford.